I did my mid life crisis 10 years ago and got myself a ZX6R Ninja. Other things to do with my money and time intruded and I had to let her go but I always intended to get myself another bike later on. I'm 60 in January and my good lady offered to by me a bike for my 60th. I hadn't even been fishing for it so I was quite taken aback and instantly energised by the thought. The idea of an "adventure" bike always appealed so the research began. Discounted the big and heavy stuff and started looking at the mid range options. Thumpers - Dakar, XT660Z or Xt660R with the latter being my favourite due to cost. Not having been aware of ABS on bikes, my reading led me to think that it seems to be a good safety feature and I wanted it so my list of thumpers now included the Sertao. wasn't really taken with that though for a number of reasons, so I looked elsewhere. Twins - Things looked really good here. Narrowed it down to the Tiger XC or the F800GS. The Tiger appealed most but then I swung back to the F800GS as the ABS has a simple switch that doesn't need menu scrolling. I did convince myself that I would be able to get a switch in there somewhere myself. The latest thing that got me thinking a bit harder was the tubed v tubeless argument. I seem to have ended up in the "tubeless" camp. That meant I would have to find another Â£2K on top of the bike price to sort it. Then I thought that despite us all thinking we would like to do a remake of Long Way Round with Charlie and Ewan, in the real world it ain't likely to happen for most of us. I would probably spend most of my time on the pavement. Maybe later I would find some dirt. So maybe I needed something that I could use on the pavement and if I ventured off road later, I could give it a go. The F700GS now loomed large in my thinking. It's dirt performance with the right tyres is, apparently, quite underrated and anyway I could always give it a go and find out for myself. I'm likely to be less able than the bike anyway. I also reasoned that if the suspension and wheels were ever to hold me back, I could beef up the rear shock and forks as others seem to have done. I also note there looks to be the possibility of putting Kineo Tubeless spoked wheels on it with a 21" on the front. I know that is a lot of cash but it is cash I can spend later if I need to and want to rather than spending it now by buying a Tiger or F800. My budget is £4-5K and I've seen decent F700s for the top end of that and by my reckoning I would have to go well north of Â£6K to get an XCX or F800 of a similiar age or mileage. That's my reasoning behind my choice of F700GS. I'm probably wrong about most of it and am happy to be corrected on any of it. Now I can't wait to get it and ride off down to the Sherburn milk bar. Might see some of you there. Welcome. The 700GS can be had for silly cheap money and will be ideal for you. (The Tiger XC is a triple, not a twin by the way) I imagine the stock bike will be fine so I'd not start chucking money at new wheels and the like...or you may as well have just got something 'right' in the first place. Don't know why I wrote it so it would look like I thought the Triumph is a twin when I know it isn't. My mistake. Your reply does reassure me, however, that I'm thinking along the right lines. I doubt I will ever need to replace the wheels but it is nice to know that the option is there. 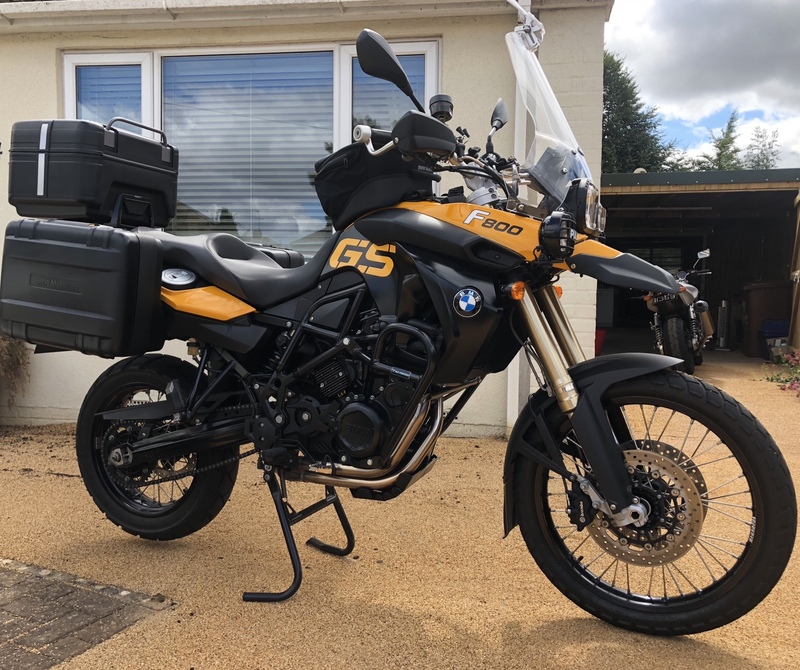 You say you would have to spend well north of £6k to get an F800GS of similar age and mileage to the 700s you have seen but then I don't think you mentioned the age or mileage !! You can get some lovely 800s for less than 5k if you look. Have I told you how many miles my F8 has done? Its high time we had a meet up for a beer ! I'm on the Hull - Zeebrugge ferry Sunday 21st. Well. I finally got around to it and will be picking up my 700 in a week or so. Really looking forward to getting some miles on it. Must have it by now, pictures..? Info.. are you happy with it.? What have you ridden previously. ?